The world is rapidly becoming a more accepting and tolerant place for people of different cultures, races, religions and sexualities, although let’s not kid ourselves into believing that prejudice of any kind is gone forever, but it is important now more than ever to set a good example in the face of bigotry and intolerance. Gay cinema, for instance, has become so widely celebrated and adored over the past few years by audiences, regardless of whatever their sexuality may be, thanks to the awards success of Moonlight, Call Me By Your Name and God’s Own Country, but up until now many of those films were much smaller and independent releases, in some cases meaning that they might not have received the much larger and mainstream crowds they deserved. That changes with the release of Love, Simon, which is quite possibly the most mainstream gay romance movie yet to be released for a teen audience, and based on how sweet and warm-hearted the movie is, then we can thankfully expect plenty more of these kind of movies to be showcased in cinemas everywhere. The movie is about Simon (Nick Robinson), a teenager with a good set of friends – among them Katherine Langford from 13 Reasons Why, and Alexandra Shipp aka Young Storm from X-Men: Apocalypse – and a loving and supportive family – including Jennifer Garner as his mother, Josh Duhamel as his father, and Annabelle: Creation standout Talitha Bateman as his younger sister – as well as being a kind and likeable young man. However, he is reluctant to tell people that he is gay, largely because he doesn’t want his life to change because of it, and so he keeps his head low and just goes about his day acting no different. He later discovers an e-mail sent by a fellow student calling himself “Blue” who admits he is also gay, and Simon frequently sends back-and-forth messages to whoever “Blue” may be, slowly becoming a bit more confident about his sexuality as well as falling for his online pen-pal. But when he is soon blackmailed by obnoxiously unappealing loser Martin (played by Logan Miller, who was also the obnoxiously unappealing loser in the awful Scouts Guide to the Zombie Apocalypse; glad to know he’s found his acting niche, I guess), everything will be thrown in a loop for poor Simon. It’s inspiring to see a movie like this not only get such a wide release, but be targeted primarily for a teen audience that is much more open and tolerant to people of LGBT backgrounds. Young people nowadays are rightfully taught that love is love, regardless of gender, and a film like this is paramount in the steps towards furthering that positive agenda within this age group, as it treats the main protagonist as a person first before defining him purely by his sexuality, and anyone who bullies or harasses them because of it is immediately seen as the villain. Simon is largely portrayed as a normal teenager who does things with his friends and family that are entirely within the realm of believability, and has other things going on in his life that don’t even relate back to his desire for men, which help make him a more defined and relatable character than just a stock closeted stereotype. Much of that comes from Nick Robinson’s lead performance, which is wonderfully sincere and honest, and should serve as a positive role model for other young gay men who, like Simon, don’t quite know how to let the world know of their true feelings. This being a teen film, you can expect there to be a fair bit of drama, with squabbles and arguments straight out of an episode of Dawson’s Creek or Riverdale, but in this movie there are parts of it that really work, as well as one or two that feel like they belong in a lesser project. Certain scenes with Simon interacting with his family and friends are emotionally resonant, often producing a good ol’ lump in the throat in the process, but there will also be scenes where you’re just cringing from the embarrassment brought on by characters’ actions. Martin is a good example of that, as he is a particularly unappealing dork who in this movie comes across as both the villain, especially when he’s blackmailing Simon, but also as some sort of comic relief you would find in absolute tripe like Status Update, with neither of the two working because Logan Miller is not a good enough actor to pull any of it off, and also the character is so uninteresting and two-dimensional you’re more annoyed by him than legitimately threatened. There are also parts of the movie that feel like they were written just so characters can be mad at each other as the third act begins in earnest, and it’s those moments that the movie feels more like a generic teen soap opera than the positive and heartwarming movie it actually is. 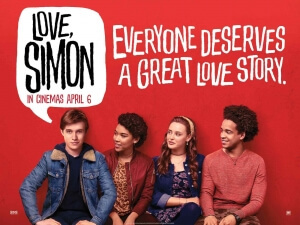 Overall, I did really enjoy this movie, and not just for its subject matter; it is a well-made, (mostly) well-written and (also mostly) well-acted teen film that really makes you beam from its non-judgmental and positive vibes, proving the tagline right by suggesting that “everyone deserves a great love story”. Sure, it certainly has its flaws, but Love, Simon is a film where its problems are outweighed by its incessant charm and likability, as well as an outstanding lead performance by Nick Robinson in a role that should be a go-to example for young people getting to grips with how they identify themselves, especially in an era that is far more accepting and open-minded than ever before. Love, Simon is a positive and affirming gay teen romance that maturely tackles its core themes and lets the core character, played by an outstanding Nick Robinson, be an actual person before being defined by his sexuality, and while it can feel like a corny teen soap opera at times it remains a charming and likeable movie for anyone of any sexuality to enjoy.